As shown in the next chapter, the Fokker-Planck equation describing the Brownian motion in arbitrary potentials, i.e., the Kramers equation, can be cast into a tridiagonal vector recurrence relation by suitable expansion of the distribution function. In this chapter we shall investigate the solutions of tridiagonal vector recurrence relations. As it turns out, the Laplace transform of these solutions as well as the eigenvalues and eigenfunctions can be obtained in terms of matrix continued fractions. Therefore, the corresponding solutions of the Kramers equation can also be given in terms of matrix continued fractions. This method has the advantage that no detailed balance condition is needed for its application. This matrix continued-fraction method is especially suitable for numerical calculations and for some problems it seems to be the most accurate and fastest method, as will be discussed in other chapters. Besides its advantage for numerical purposes, the matrix continued-fraction solutions are also very useful for analytical evaluations. By a proper Taylor series expansion of the matrix continued fractions we obtain, for instance, in Sect. 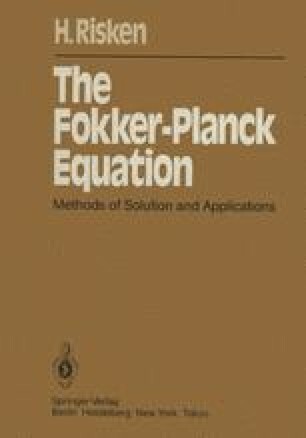 10.4 the high-friction limit solutions of the Kramers equation.